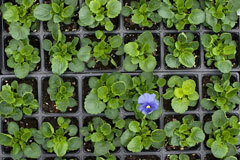 Garden plants are the focus of the website GardenPlants.us. This website defines the types of garden plants available and explains the differences between these types. It also gives tips for selecting garden plants based on your gardening experience and needs. Links to online garden shops and rose nurseries are included, as well as links to general gardening resources. Visitors can learn about garden annuals, perennials, ground covers, flower bulbs, and shrubs. They can also browse through garden center websites, where they can buy garden plants, supplies, and accessories. Captioned photos hereon include an entrance garden, pink and white tulips in a botanical garden, a flat of pansy plants, and blue pansy blooms in a field. Additional photos include a field of red tulips, a cluster of purple clematis, an azalea shrub in bloom, and pink dogwood flowers. All information on GardenPlants.us is provided "as is." This website contains informative articles, reviews, and resource links about garden plant varieties. By using this website, you agree that Zeducorp is not responsible for errors or omissions, and shall have no liability for damages of any kind, including special, indirect, or consequential damages, arising out of or resulting from any information, product, or service made available hereunder or the use or modification thereof. Thank you for visiting the GardenPlants.us website. We trust that you have found our website useful, and we invite you to place a link to GardenPlants.us on your website. Simply copy the following HTML link and paste it on one of your website pages to reference this informative website. We appreciate your consideration. GardenPlants.us, a division of Zeducorp.